A leveraged buyout (or LBO, or highly-leveraged transaction (HLT), or "bootstrap" transaction) occurs when an investor, typically financial sponsor, acquires a controlling interest in a company's equity and where a significant percentage of the purchase price is financed through leverage (borrowing). The assets of the acquired company are used as collateral for the borrowed capital, sometimes with assets of the acquiring company. 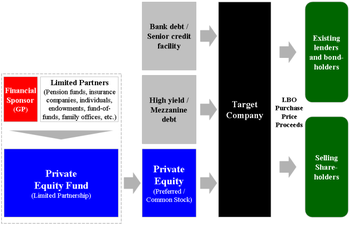 Typically, leveraged buyout uses a combination of various debt instruments from bank and debt capital markets. The bonds or other paper issued for leveraged buyouts are commonly considered not to be investment grade because of the significant risks involved. Leveraged buyouts involve an investor, financial sponsors (like a private equity firm) making large acquisitions without committing all the capital required for the acquisition. To do this, a financial sponsor will raise acquisition debt which is ultimately secured upon the acquisition target and also looks to the cash flows of the acquisition target to make interest and principal payments. Acquisition debt in an LBO is therefore usually non-recourse to the financial sponsor and to the equity fund that the financial sponsor manages. Furthermore, unlike in a hedge fund, where debt raised to purchase certain securities is also collateralized by the fund's other securities, the acquisition debt in an LBO is recourse only to the company purchased in a particular LBO transaction. Therefore, an LBO transaction's financial structure is particularly attractive to a fund's limited partners, allowing them the benefits of leverage but greatly limiting the degree of recourse of that leverage. As a percentage of the purchase price for a leverage buyout target, the amount of debt used to finance a transaction varies according to the financial condition and history of the acquisition target, market conditions, the willingness of lenders to extend credit (both to the LBO's financial sponsors and the company to be acquired) as well as the interest costs and the ability of the company to cover those costs. Typically the debt portion of a LBO ranges from 50%-85% of the purchase price, but in some cases debt may represent upwards of 95% of purchase price. Between 2000-2005 debt averaged between 59.4% and 67.9% of total purchase price for LBOs in the United States. To finance LBO's, private-equity firms usually issue some combination of syndicated loans and high-yield bonds. Smaller transactions may also be financed with mezzanine debt from insurance companies or specialty lenders. Syndicated loans are typically arranged by investment banks and financed by commercial banks and loan fund managers, such as mutual funds, hedge funds, credit opportunity investors and structured finance vehicles. The commercial banks typically provide revolving credits that provide issuers with liquidity and cash flow while fund managers generally provided funded term loans that are used to finance the LBO. These loans tend to be senior secured, floating-rate instruments pegged to the London Interbank Offered Rate (LIBOR). They are typically pre-payable at the option of the issuer, though in some cases modest prepayment fees apply. High-yield bonds, meanwhile, are also underwritten by investment banks but are financed by a combination of retail and institutional credit investors, including high-yield mutual funds, hedge funds, credit opportunities and other institutional accounts. High-yield bonds tend to be fixed-rate instruments. Most are unsecured, though in some cases issuers will sell senior secured notes. The bonds usually have no-call periods of 3–5 years and then high prepayment fees thereafter. Issuers, however, will in many cases have a "claw-back option" that allows them to repay some percentage during the no-call period (usually 35%) with equity proceeds. Another source of financing for LBO's is seller's notes, which are provided in some cases by the entity as a way to facilitate the transaction. Similar to the approach employed in the McLean transaction, the use of publicly traded holding companies as investment vehicles to acquire portfolios of investments in corporate assets was a relatively new trend in the 1960s, popularized by the likes of Warren Buffett (Berkshire Hathaway) and Victor Posner (DWG Corporation), and later adopted by Nelson Peltz (Triarc), Saul Steinberg (Reliance Insurance) and Gerry Schwartz (Onex Corporation). These investment vehicles would utilize a number of the same tactics and target the same type of companies as more traditional leveraged buyouts and in many ways could be considered a forerunner of the later private equity firms. In fact it is Posner who is often credited with coining the term "leveraged buyout" or "LBO"
The leveraged buyout boom of the 1980s was conceived by a number of corporate financiers, most notably Jerome Kohlberg, Jr. and later his protégé Henry Kravis. Working for Bear Stearns at the time, Kohlberg and Kravis, along with Kravis' cousin George Roberts, began a series of what they described as "bootstrap" investments. Many of the target companies lacked a viable or attractive exit for their founders, as they were too small to be taken public and the founders were reluctant to sell out to competitors. Thus a sale to a financial buyer might prove attractive. Their acquisition of Orkin Exterminating Company in 1964 is among the first significant leveraged buyout transactions. [unreliable source?]. In the following years the three Bear Stearns bankers would complete a series of buyouts including Stern Metals (1965), Incom (a division of Rockwood International, 1971), Cobblers Industries (1971), and Boren Clay (1973) as well as Thompson Wire, Eagle Motors and Barrows through their investment in Stern Metals. By 1976, tensions had built up between Bear Stearns and Kohlberg, Kravis and Roberts leading to their departure and the formation of Kohlberg Kravis Roberts in that year. Drexel reached an agreement with the government in which it pleaded nolo contendere (no contest) to six felonies—three counts of stock parking and three counts of stock manipulation. It also agreed to pay a fine of $650 million—at the time, the largest fine ever levied under securities laws. Milken left the firm after his own indictment in March 1989. On February 13, 1990 after being advised by United States Secretary of the Treasury Nicholas F. Brady, the U.S. Securities and Exchange Commission (SEC), the New York Stock Exchange, and the Federal Reserve, Drexel Burnham Lambert officially filed for Chapter 11 bankruptcy protection. The combination of decreasing interest rates, loosening lending standards and regulatory changes for publicly traded companies (specifically the Sarbanes-Oxley Act) would set the stage for the largest boom private equity had seen. Marked by the buyout of Dex Media in 2002, large multi-billion dollar U.S. buyouts could once again obtain significant high yield debt financing and larger transactions could be completed. By 2004 and 2005, major buyouts were once again becoming common, including the acquisitions of Toys "R" Us, The Hertz Corporation, Metro-Goldwyn-Mayer and SunGard in 2005. A special case of a leveraged acquisition is a management buyout (MBO), which occurs when a company's managers buy or acquire a large part of the company. The goal of an MBO may be to strengthen the managers' interest in the success of the company. In most cases when the company is initially listed, the management will then make it private. MBOs have assumed an important role in corporate restructurings beside mergers and acquisitions. Key considerations in an MBO are fairness to shareholders, price, the future business plan, and legal and tax issues. One recent criticism of MBOs is that they create a conflict of interest—an incentive is created for managers to mismanage (or not manage as efficiently) a company, thereby depressing its stock price, and profiting handsomely by implementing effective management after the successful MBO, as Paul Newman's character attempted in the Coen brothers' film The Hudsucker Proxy. It is fairly easy for a top executive to reduce the price of his/her company's stock - due to information asymmetry. The executive can accelerate accounting of expected expenses, delay accounting of expected revenue, engage in off balance sheet transactions to make the company's profitability appear temporarily poorer, or simply promote and report severely conservative (e.g. pessimistic) estimates of future earnings. Such seemingly adverse earnings news will be likely to (at least temporarily) reduce share price. (This is again due to information asymmetries since it is more common for top executives to do everything they can to window dress their company's earnings forecasts). A secondary buyout is a form of leveraged buyout where both the buyer and the seller are private equity firms or financial sponsors (i.e. a leveraged buyout of a company that was acquired through a leveraged buyout). A secondary buyout will often provide a clean break for the selling private equity firms and its limited partner investors. Historically, however, secondary buyouts were perceived as distressed sales by both seller and buyer, were considered unattractive by limited partner investors and were largely avoided. Some kinds of businesses—e.g., those with relatively slow growth but which generate high cash flows—may be most appealing to private equity firms than they are to public stock investors or other corporations. An LBO analysis is designed to estimate the current value of a company to a financial buyer, based on the company's forecasted financial performance. LBO analysis typically builds upon a medium-term forecast (typical investment horizon for financial sponsors is 3–7 years) to project future operating results. ^ David Carey and John E. Morris, King of Capital: The Remarkable Rise, Fall and Rise Again of Steve Schwarzman and Blackstone (Crown 2010), pp. 15-16. ^ King of Capital, pp. 31-44. ^ See King of Capital, pp. 211-12. This page was last modified on 26 March 2011 at 20:41.